My heart and prayer goes to all the Japanese affected by the recent earthquake and tsunami , and currently the aftermath which is obviously still on going. There is no need for me to elaborate further as you should already seen, read and hear about it from various media means. I wanted to write about my recent Bareno outing but in the light of the recent happenings in Japan, I am not in the mood to.. Let us all together say a little prayer for Japan. missjewelz, from the bottom of her heart wishes that all Japanese stay together united and strong. http://youtu.be/zuMLtycp_0I <<— got this link from ‘Chiefy’. TQ for sharing !! Malaysia PM’s wife with shallow comments on Japan. Almost hilarious as well ! While the ‘jokers’ continue to make us Malaysian look stupid ..
Oh well, I think the Japanese CAN do much much better than what this country can do IF something of this scale were to happen here.. (nauzubillah minta jauh..) . While words can be sharper the edge of a sword, blunt words are simply a projection of our mentality. Blunt, empty, hollow — which badly needs some filling and sharpening. And this ‘first lady’ thingy..? Looks like we do not have anymore important and relevant issues to discuss and criticize. Yawnn.. WAKE UP MALAYSIA !!!! p.s. missjewelz will resume her Bareno Run report tomorrow or day after. While I am a proud Malaysian, actions of certain leaders in this country sometimes make me sick..
We Malaysians express our deepest sympathy to Japan. We believe that your country will rise and recover soon. May all the innocent lives lost be in a better place. God Bless. Chiefy, thanks for sharing the YouTube link ! i have updated it in this post. nice cover… & let us pray for them & ambik pengajaran of the world around us.. insyaAllah. May Allah be with us… & guide us.. WTFBBQ!! kak ros, kak ros…!!! seriously she’s out of her mind talking like that!!! 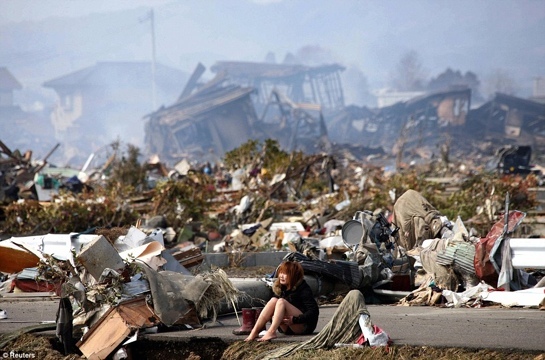 japan is a technological advance country, they ready to face the earthquake, but tsunami is no joke man!!! kak Ros pulak..?ayyaa… she’s not out of her mind.. her mind was apparently was not tuned to the right channel that time..
As much as I am worried about the people in Japan (having close relatives staying in Sendai does not help either), the impact on the economy is big, as Japan is the third biggest economy in the world currently. Don’t forget too, that Japan loans a lot of money out to a lot of countries.. and if the investors do plan to take their money back, let’s just say prices will go up again to the rest of us.. Thank you for shedding some lights unto this Jonie. Yes, definitely. Japan should buck up quick as world’s economy is interdependent on them as well. In fact the Japan bank will be funding trillion of yen (if I’m not wrong) for the country to revive. What I meant is that at the initial stage of this shock, condolence and help should be forwarded. The same thing when one passes on.. Condolence and contributions are offered first. I was talking about the human emotion factor. Let us hope Japan recovers fast and pray goodness will come their way by all means possible.